We are involved in offering a precisely designed Ammonia Receiver which is created and manufactured using quality approved raw material. Our offered range is highly popular in the market for their reliability and durability. Our offered products are sternly checked by our quality analyst on well defined parameters to ensure their faultless delivery at client premises. Established in the year 1963, we GRR Industries are recognized organization in the market, highly indulged in Manufacturing, Exporting, Supplying, Trading, Service Providing an extensive collection of Industrial Product. Our offered range consists of Autoclaves, Alternators Spare Parts, Dish Ends, Pressure Vessels, Pickling Tanks, Heat Exchangers, Heavy Fabrication Work, Boilers and Boilers Spares, Electric Machinery Fabrication and Pipe Bends. Our offered products are highly demanded in the market for their superior finish, durability and low maintenance. 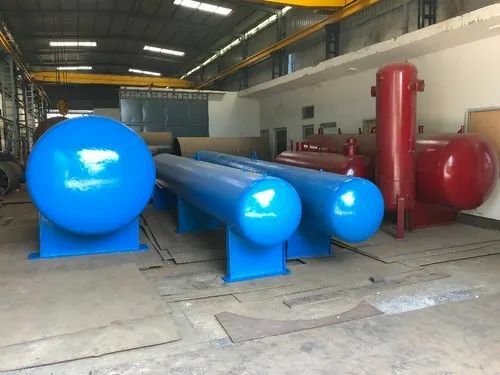 Under these categories we provide Flat Dished Ends, Dish Ends, Surge Vessel, Nitrogen Storage Pressure Vessels, Pressure Vessels, Condensate Storage Vessel, Pickling Tanks, Wire Pickling Tank, Pickling Tank with MS Structure, Heat Exchanger, Heavy Fabrication Work, Medium Type Boilers and Pipe Bends. We also provide Steel fabrication of autoclaves, alternators spare parts, dish ends, pressure vessels, pickling tank to our client. Our offered products are manufactured under the supervision of skilled professional using quality approved raw material and sophisticated technology in adherence with international quality norms and guidelines. The raw material which we utilize is procured from the trustworthy and reliable vendor of the market. To satisfy the varied need of our customers, these are available in various sizes and specifications. Further, we also provide these products in customization facility to fulfill the exact needs and choices of our patrons.We only deals in Delhi NCR.